Our mission at Lagan Valley Island is to provide a high quality venue, offering the best value and highest standard of service to our customers and their customers in a personal and professional way. We aim to exceed expectation and to continually develop and improve our service with the goal of being the venue of choice for all of our customers. An exceptional, seamless and adaptable service and operating standards that put the customer first every time. Packages which represent good value for money with no hidden extras. Click here to read our full Customer Charter outlining our promises to you, our customer. This customer charter was created in alignment with the principles of the Lisburn City Council Customer Service Guidelines. Following recent consultation with our customers, we are delighted to present to you the positive changes we have implemented to further improve the high levels of service we currently deliver. 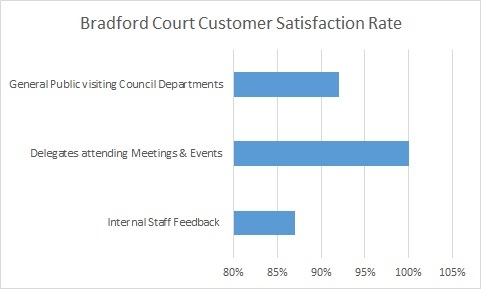 We are delighted with the high satisfaction levels achieved but will strive to improve even more. We are always keen to hear any feedback you may have about our service so please feel free to email us at lvi@lisburncastlereagh.gov.uk to tell us about your experience. In a bid to ensure we fulfil our promises, we regularly survey our customers to find out how we are doing, what we are doing right and what we should change. 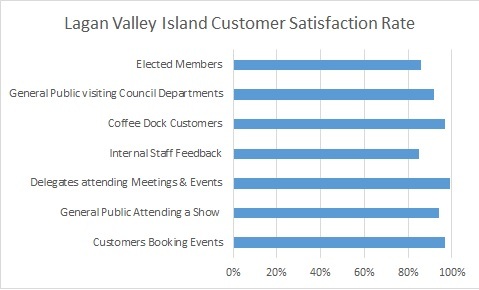 Customer Satisfaction is one of the highest priorities here at Lagan Valley Island.